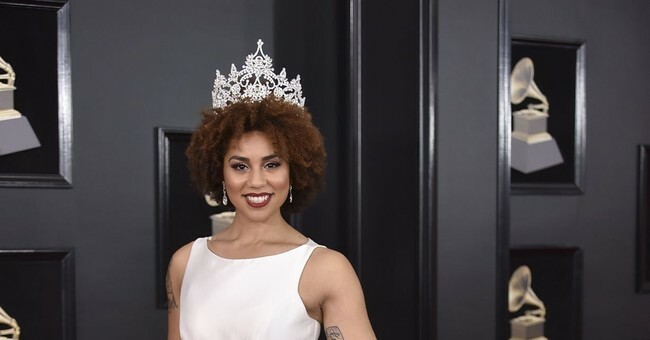 Joy Villa stunned the red carpet at the Grammys on Sunday with her outfit that once again made quite the political statement. "I'm a pro-life woman. This year I chose to make a statement on the red carpet like I always do," she told Fox News. "I'm all about life." Villa turned heads at last year’s Grammy Awards when she showed up wearing a pro-Trump, Make America Great Again dress that was red, white, and blue. The singer said she's been extremely pleased with President Trump thus far. "I love what he is doing; unemployment is down," she said, reports Fox News. "I am totally for President Trump, and it's only been one year. I can't wait for the next seven years!" The 26-year-old also spoke highly of the president’s tax plan. "I'm looking forward to saving money on my taxes as a small-business woman," she said. "I am looking forward to seeing Americans... [feeling patriotic] again. I'm glad that conservative values are back at the forefront as a pro-life woman."